Avro 679 Manchester je bil britanski dvomotorni težki bombnik, ki ga je razvil Avro med 2. svetovno vojno. Uporabljali sta ga Kraljeve letalske sile (RAF) in Kraljeve kanadske letalske sile (RCAF). Posebnost Manchestra je, da je za pogon uporabljal X-motorja in sicer dva 24-valjna Rolls-Royce Vulture. Kljub 1760 konjskim silam vsak, sta bila motorja za to letalo prešibka in nezanesljiva. Manchester je imel bombni tovor slabih pet ton, kar je bilo sorazmerno veliko za dvomotorni bombnik tistega časa. Proizvodnja Manchestra je trajala samo dve leti in obsegala okrog 200 letal. Je bil Manchester predhodnik zelo uspešnega Avro Lancastra. 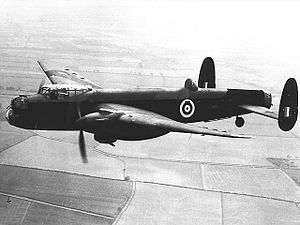 "Avro Manchester - Details and Performance of Our Heaviest Twin-engined Bomber." Flight International, 4 June 1942. pp. 555–557. Buttler, Tony. British Secret Projects: Fighters and Bombers 1935–1950. Hickley, UK: Midland Publishing, 2004. ISBN 978-1-8578-0179-8. Lake, Jon. The Great Book of Bombers: The World's Most Important Bombers from World War I to the Present Day. Zenith Imprint, 2002. ISBN 0-76031-347-4. Lewis, Peter. The British Bomber since 1914. London: Putnam, Second edition, 1974. ISBN 0-37010-040-9. "Manchesters". Aeromilitaria No. 2. Tonbridge, Kent, UK: Air-Britain (Historians) Ltd., 1990. Mason, Francis K. (1994). The British Bomber since 1914. London: Putnam. ISBN 9780851778617. Sinnott, Colin. The RAF and Aircraft Design 1923–1939: Air Staff Operational Requirements (Studies in Air Power). London: Frank Cass, 2001. ISBN 978-0-7146-5158-3. Thetford, Owen. Aircraft of the Royal Air Force 1918-57. London: Putnam, First edition, 1957. ISBN 0-37000-101-X. Holmes, Harry. Avro: The History of an Aircraft Company. Marlborough, UK: Crowood Press Ltd, Second edition, 2004. ISBN 1-86126-651-0. Jackson, Robert. Aircraft of World War II. Enderby, UK: Silverdale Books, 2006. ISBN 1-85605-751-8. Kirby, Robert. Avro Manchester: The Legend Behind the Manchester. Leicester, UK: Midland Publishing, 1995. ISBN 1-85780-028-1.